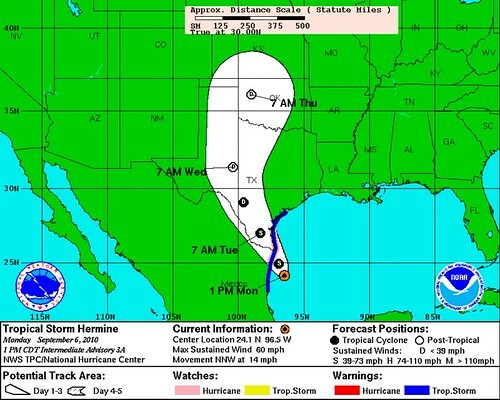 Tropical storm Hermine in headed toward Austin. Unlike most tropical storms, it didn't come off the coast of Africa, it formed out of a bunch of clouds in the Gulf of Mexico. I'll be grateful for the rain, I just hope we don't get too much of it. how do you pronounce hermine? According to Fox, it's pronounced Her-meen (http://weather.blogs.foxnews.com/2010/09/06/hello-hermine/).